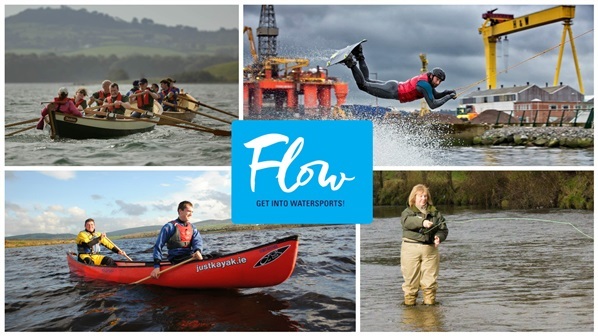 Over 20 watersport clubs are opening up their doors and offering local people the opportunity to take part in a range of taster events as part of a new initiative called Flow. Over the weekend of 14th & 15th May participants will be able to try their hand at canoeing, sailing, water-skiing, wakeboarding, kite surfing, rowing, angling, stand up paddle boarding and diving for as little as £10 or less! To give you a flavour of what’s happening over the weekend we’ve selected some of our favourite events! Enjoy an introductory rowing session on the River Foyle and be part of a crew learning new skills. Have a go in a kayak on the water and play a game of canoe polo. This will be a fun intro session into a great sport at a state of the art canoe polo facility in Belfast. Once in a lifetime opportunity for beginners to compete for a place in the selection squad going to the Skiffie World Championships on home waters on Strangford Lough from 25th – 30th July. County Antrim Yacht Club are holding an afternoon of taster sessions from 1.30pm - 5pm for beginners to have a go! See Belfast from the river and feel the sleek boat glide through the water underneath you as you learn to row. Beverley used to be a keen horse rider but since joining a local cycle club in 2013 she has developed a passion for 2 wheels instead of 4 hoofs! Meaning she can often be found on a bike exploring the roads across the country! Northern Ireland is well known for its mix of weather conditions in a day let alone each season. But don't let a bit of bad weather put you off your next adventure! Here are some fantastic activity ideas that you can do rain, hail or shine. Summer heat waves may be few and far between but that's still not an excuse to avoid the beach - some of the best surf comes when the sun isn't shining. Grab a surf board and wetsuit and run towards the water - the best waves to surf can be found on the North Coast of Co. Antrim and Co. Derry~Londonderry. Book a session or rent a board from experienced instructors at Long Line Surf School or Troggs Surf School who will teach you the best tips and tricks to see you riding your first wave into the shore! With rain comes mud and so you might as well make the most of it! Grab some friends and share the driver's seat at Todds Leap Activity Centre as you head off road to conquer the muddy climbs and downhill descents of Northern Ireland's most exhilarating terrain in a Land Rover. The muddier the better! When it rains you're going to get wet anyway so why not embrace it and submerge yourself in water?! Pull on a wetsuit and make a splash along some of Northern Ireland's most spectacular coastline! With no experience necessary and all the best kit to keep you warm follow your instructor as you climb, scramble and jump off rocks into the sea along the spectacular coast (coasteering) or up rivers (wet bouldering). Check out some of the fantastic experiences to explore the coast with Outdoor Concepts, Life Adventure Centre or Clearsky Adventure Centre. If you're a real warrior the weather won't stop you from going to battle! Whether you are planning the ultimate Stag weekend or just a day out with friends a paintball session will be sure to separate your friends from your enemies. With a number of specifically designed paintballing and combat providers across Northern Ireland all with creatively themed paint balling game zones to choose from, this is one activity guaranteed to get your adrenaline pumping. Bad weather is no excuse to leave your bike in the shed. With 3 purpose-built national trail centres and 3 regional trail centres to choose from across the country, fun and challenging riding is on offer whatever the weather to riders of all abilities. Each season brings with it different riding conditions making for a new, exciting and memorable experience with each visit. With bike wash facilities and mountain bike hire available there's no need to worry about a bit of muck getting into your car! If you're out enjoying our wild and wonderful outdoors make sure to send us your pictures @OutdoorNI on Twitter or via the OutdoorNI Facebook Page. You’ve been indoors most of the winter and now the warmer weather and sunshine is calling you outside. But what should you do once you get out there? With that in mind we wanted to share a few tips of how to make the most of the outdoors this spring. With no experience necessary and all levels catered for, there really is nothing stopping you. Try a new activity for the first time. Whether you are looking to have a go on the mountain bike trails, take aim during an archery session or paddle down river in a kayak/canoe there are lots of activities for you to try for the first time across Northern Ireland this spring. Click here to find out what's on. Spring into action and make 2016 the year you learn a new skill from the experts! With a whole host of courses designed specifically for beginners and led by qualified and experienced instructors you're sure to pick up lots of new skills & techniques for your next adventure. Designed to suit your busy lifestyle courses vary from 1 day to multi day and evening sessions, so there really is no excuse. See here for a list of courses. You don’t have to spend hours travelling across the country in search of your next adventure. Whether you are looking for a day out just a stone's throw from the city centre or high up in the mountains we have the perfect list of activities for you. Check out our Top Tips in North Coast, Derry~Londonderry, Sperrins, Belfast, Fermanagh, Mournes, Strangford to find out what's on your doorstep this spring. Memories can be made, fears can be fought and the laughs will be louder with a friend by your side. For those seeing an adrenaline rush, our list of experiences won't be forgotten about in a hurry! From skydiving and off road driving to zip lining and paintballing the hardest part of planning this adventure will be deciding what activity to try first. To plan an epic day out with friends Click here to discover what experiences await! Tell us about your adventures on facebook & Twitter. Must Try Watersports for £10 or Less! Over the weekend of Saturday 14th and Sunday 15th May there will be over 20 watersport clubs based all over Northern Ireland offering local people an opportunity to ‘Have a Go’ in a range of watersports for as little as £10 or less! With no previous experience necessary and taster events in canoeing, sailing, water skiing, wake boarding, rowing, angling, stand up paddle boarding and diving there has never been a better time to get on the water and get wet! Sailing has everything, from being a sociable relaxing experience to a high adrenaline, high action sport. Experience the adrenaline buzz of skimming across the water in a small dinghy or be part of a team in a larger keelboat. Come and ‘have a go’ at Cushendall Sailing & Boating Club for free! Learn the fundamentals of how to paddle a canoe and then give the rapidly growing team sport of canoe polo a go in this fun introductory session. A women’s only session is also available from 3pm - 4.30pm, subject to demand. Let’s go fly a kite on an introductory session led by qualified kite surfing instructors on dry land. This event will take place on Tyrella Beach and is designed to elevate you into kite surfing! On the day you will be taken through a range of skills and techniques to get you launching your own kite. Angling is a male dominated sport but this all-day taster event will give women the chance to find out what it's all about. Taking place at Straid Fishery which is a 20 acre lake, participants will benefit from the presence of some of the 2016 International Ladies Fly Fishing Team being on hand to guide participants. Enjoy a leisurely row on a traditional wooden boat on the River Lagan finished off with a visit to 'T13' in the Titanic Quarter of Belfast where you will get a guided tour of the build of a 33ft 10 man currach rowing boat. Have a go and experience this exhilarating water sport with encouraging instruction given at all times to ensure success. Take in the scenery around Lough Erne as you try your hand at Stand Up Paddleboarding with Erne Paddlers. This is a fast growing paddle sport providing a great fun core work out with the possibility of getting wet! 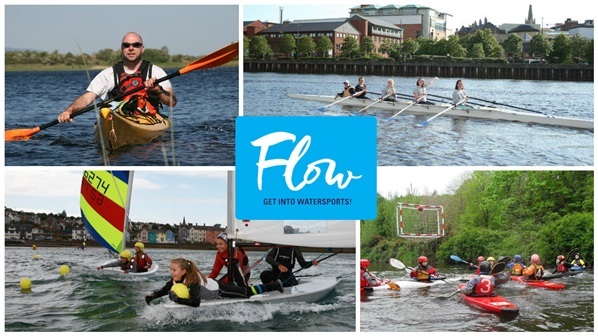 These taster events are being offered as part of a wider campaign called ‘Flow – Get into Watersports’. This campaign is an ideal way for those with no background in watersports to learn the basics under the watchful eye of qualified instructors through taking part in one of the many taster events. These taster events will be followed closely by a series of training programmes for those looking to continue in their chosen sport. With too many to mention make sure to visit FlowNI.com for a full list of the events on offer in your local area.